Editor’s Note: This story originally appeared April 25, 2012. • Hotshot crews were first used in Southern California after World War II. • The name "hotshot" comes from the hottest part of the fire, the place where these crews are usually work. • Crews can be sent across the country, often hiking or taking a helicopter into rugged terrain. • Crews are required to remain on call during fire season, which can last up around six months. • Because of their demanding jobs, hotshots are required to maintain a high fitness level. • Interagency Hotshot Crews (IHC), the umbrella organization for hotshot crews, was created in the early 1980s. “Get down! Heads toward center!” Maldonado yells, the urgency in his voice rising. Diving to the ground, crew members attempt to form a tight circle and point their feet toward the approaching flames. That will deflect heat and help protect their torsos. They clamp down on the edges of their emergency shelters to make sure fire, smoke and heat can’t get inside, and they keep their faces near the ground to breathe cooler air that won’t damage their lungs. There’s nothing to do now but wait. Walking among the shelters several minutes later, Maldonado and another squad leader, Clayton Whitted, see that first-year hotshot Shane Arollado has made a fatal mistake: His head pointed toward the approaching fire. Suddenly the survivors ask playfully if Arollado’s girlfriend is now available. 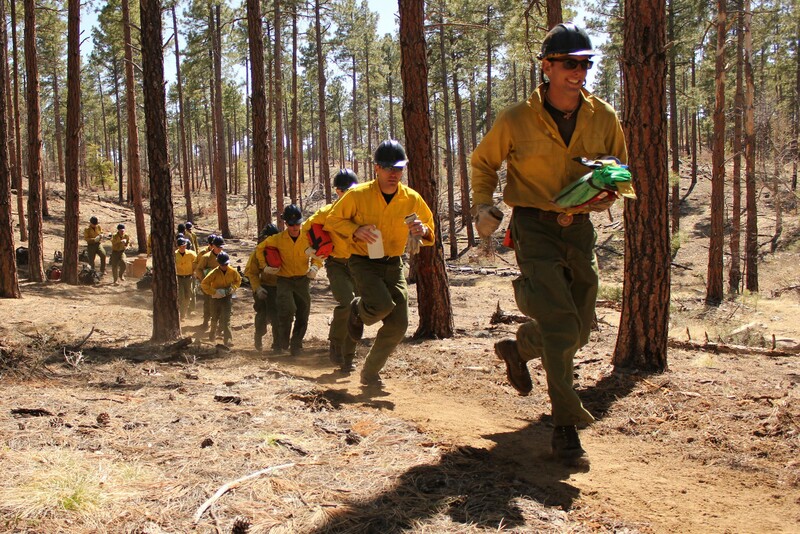 Members of the Granite Mountain Hotshots, one of 112 Interagency Hotshot Crews around the country, have never had to use shelters during a wildfire. But working in remote locations to get ahead of the most dangerous sections of fires makes knowing how to do so a matter of life and death. Training is crucial, especially for the four rookies on the 22-member squad. “If we’re not actually doing it, we’re thinking and planning about it,” said Eric Marsh, superintendent of the Granite Mountain Hotshots. The crew, one of 13 hotshot teams in Arizona, has eight full-time members. The rest work from April until September. Brady Higgs, in his second year with the crew, said the camaraderie and opportunity to travel drew him to this job. Being on a hotshot crew means one is on call throughout fire season, staying close enough to head out on short notice. Fire duty can mean staying in the forest rather than returning to base camp for the night. Members of the Granite Mountain Hotshots sometimes have to spend up to two straight weeks in the wilderness, getting supplies by helicopter. 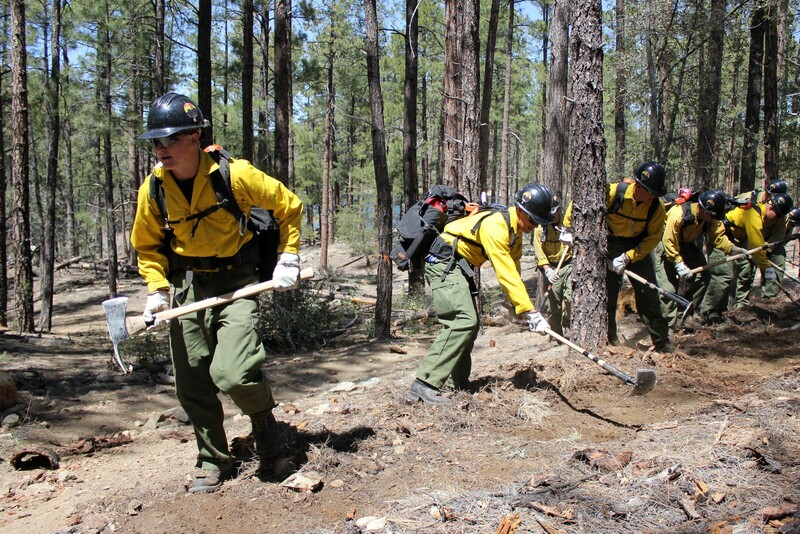 Last year, the Granite Mountain Hotshots fought some of the biggest fires in Arizona — Wallow, Horseshoe Two and Monument – as well as blazes in states such as Colorado, New Mexico and Minnesota. Having to operate in the wilderness with little support, training is a way of life. 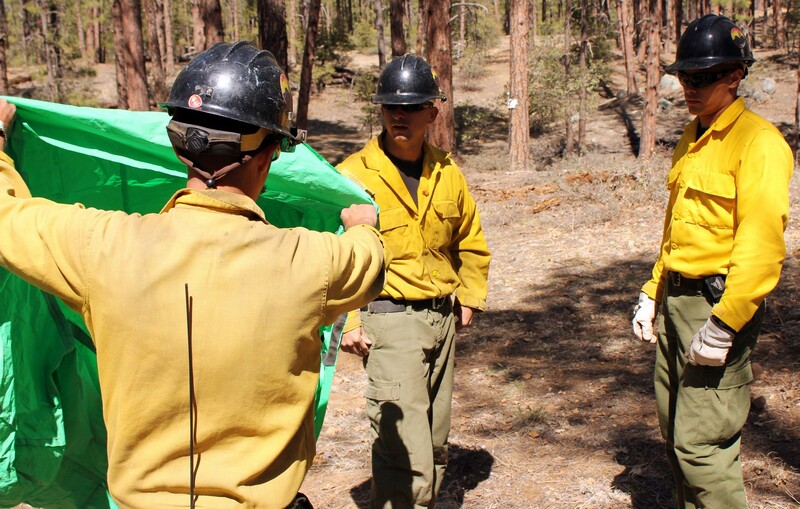 On a recent weekday, preparing for fire season, members of the Granite Mountain Hotshots practiced setting up fire shelters as well as cutting fire lines. The day included watching a video on how to use emergency shelters and what conditions crew members might face if overrun by fire. The video featured survivors of the 1990 Dude Fire near Payson, in which six firefighters died despite wrapping themselves in shelters. 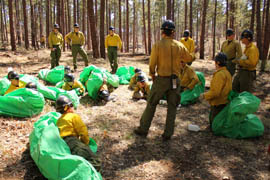 For training, crew members used green tarps shaped and packaged like fire shelters. Once the hotshots got inside, other crew members yanked on the tarps to simulate the high winds they could face. After running the exercise once, they did it again. When Arollado “died” during both run-throughs – it was his first time using a shelter – squad leaders Maldonado and Whitted pulled him aside to give tips. The crew also dug 1,000 feet of 3-foot-wide fire line, with some hotshots wielding chainsaws to cut down down trees and bushes. Marsh, the crew’s superintendent, said later that everyone was rusty with training just under way. It’s particularly difficult for rookies who only have classroom experience, he said. But better to have mistakes happen here, where training can correct them, than in a real fire. Being in a hotshot firefighting crew means working at the hottest – and most dangerous – points of wildfires, often in rugged terrain where little support is available. With wildfire season at hand, training is essential. Cronkite News reporter Cory Galvan reports. 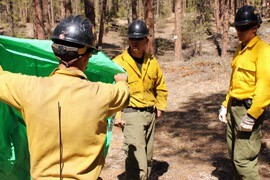 Phillip Maldonado, a squad leader with the Granite Mountain Hotshots, helps crew member learn the finer points of setting up emergency fire shelters. 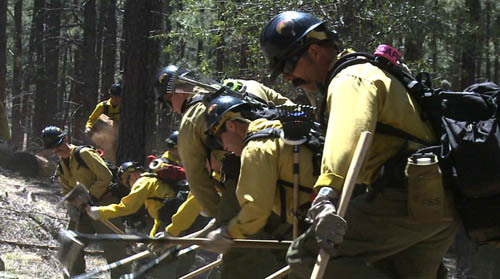 Training is key as the crew prepares for what's expected to be a busy wildfire season. Members of the Granite Mountain Hotshots run during training on the use of emergency fire shelters. 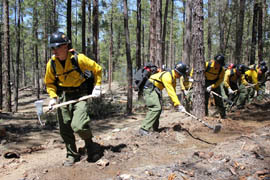 Members of the Granite Mountain Hotshots practice cutting fire lines. 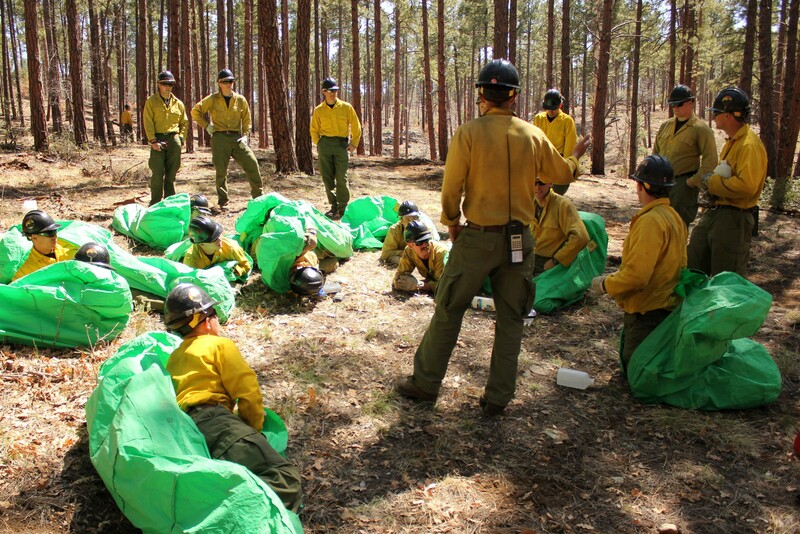 Granite Mountain Hotshots, shown during an April 2012 training session, practice with tarps in place of the emergency fire shelters they would use if trapped in an actual blaze.